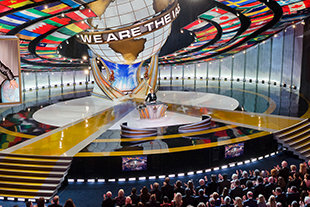 Scientologists from 172 Nations Proclaim: We are the IAS! The annual IAS celebration highlighted a dynamic year of growth for Scientology and unparalleled accomplishments for IAS-sponsored humanitarian programs now at work in 162 nations. More than 50 recipients of the IAS Freedom Medal attended the 29th IAS Anniversary weekend of events. Crowning the IAS Anniversary celebration were the announcements of the 2013 recipients of the IAS Freedom Medal—those exemplary Scientologists who champion dignity and freedom for all humanity by forwarding the Church’s greater humanitarian objectives. More than 6,500 members of the International Association of Scientologists, representing some 50 nations, filled Flag’s Grand Marquee for the live IAS Anniversary event. Dauntless, defiant and resolute: WE ARE THE IAS! On the evening of November 30, IAS members gathered once again beneath the Grand Marquee for the annual IAS Patrons Ball. The elegant affair celebrated the greatest number of IAS Patrons in history, acknowledging them for unprecedented contributions to IAS-sponsored programs that are advancing Scientology’s aims for a better world. The celebration in honor of IAS Patrons concluded with a concert featuring jazz legends Chick Corea (IAS Freedom Medal Winner) and Stanley Clarke. A knight astride a white stallion. A ceremonial drum and bagpipe regiment. More than 6,500 Scientologists, representing some 50 nations, advancing into the Great Hall for a celebration. Such was the pageantry that heralded the 29th anniversary of the International Association of Scientologists (IAS), convened on the weekend of November 29 in Clearwater, Florida. The anniversary was celebrated just two weeks after the historic grand opening of the new Scientology spiritual headquarters and the monumental release of the Golden Age of Tech Phase II. The celebration highlighted a dynamic year of growth for the Scientology religion and unparalleled accomplishments for the IAS-sponsored humanitarian programs now at work in 162 nations. Crowning the celebration were the announcements of the 2013 recipients of the International Association of Scientologists Freedom Medal. The annual award is presented to those exemplary Scientologists who champion dignity and freedom for all humanity by forwarding the Church’s greater humanitarian objectives. The three 2013 Freedom Medal winners were recognized, respectively, for spearheading federal legislation in Mexico that now protects all citizens from psychiatric drugging and brutality; for effectively promoting the United Nations Universal Declaration of Human Rights across Taiwan and educating millions on their inalienable rights; and for saving tens of thousands of lives from drug addiction in Nepal through the Narconon program—now with an IAS-sponsored residential drug rehabilitation facility atop Hubbard’s Peak, a Himalayan summit above Kathmandu named by the Nepalese in honor of L. Ron Hubbard. More than 50 past IAS Freedom Medal awardees attended the weekend of events. The following evening, thousands of Scientologists gathered again for the annual IAS Patrons Ball. The elegant, black-tie affair welcomed the greatest number of IAS Patrons in history, acknowledging them for unprecedented contributions to IAS-sponsored programs that are advancing Scientology’s aims for a better world. Those in attendance included 270 Patrons, 165 Patrons with Honors, 145 Patrons Meritorious, 130 Silver Meritorious, 33 Silver Meritorious with Honors, 76 Gold Meritorious and 17 Gold Meritorious with Honors. Then, too, there were the rarified levels of contribution: 52 Platinum Meritorious, 39 Platinum Meritorious with Honors, 29 Diamond Meritorious and the exalted ranks of Patrons Laureate, Excalibur and Maximus. The IAS Patrons celebration concluded with a concert featuring jazz legends Chick Corea (IAS Freedom Medal Winner) and Stanley Clarke.